In other news, I dropped my bus pass yesterday – if any locals find a bus pass which doesn’t expire till 6th June, please please please hand it in to First Buses lost property, I’d be so grateful (especially if it’s mine!! 😀 ). If it was on a bus where I lost it it will have been on a number 66. Thanks so much! This entry was posted on May 8, 2009 at 12:01 am	and is filed under Uncategorized. Tagged: Glasgow, Queens Park, swans. You can follow any responses to this entry through the RSS 2.0 feed. Both comments and pings are currently closed. Sorry about your bus pass. This photo is superb, however. I love the muted colors…very much like a soft painting! 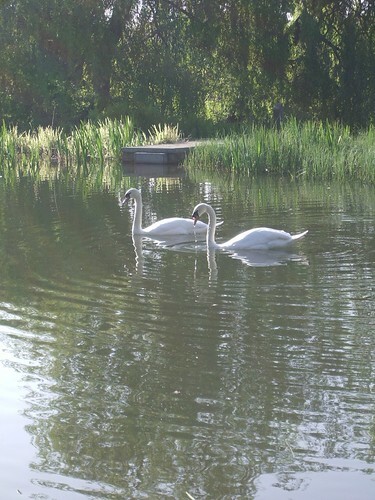 Beautiful, beautiful swans! A little more sophisticated than the lot that swarmed me for cracked corn a couple of months ago!!! Jacob is right…the photo does look very much like a painting! If I were to give it a name, it would be ‘Peace and Grace’! Oh, how frustrating to lose your bus pass! I certainly hope an honest soul finds it and turns it in for you! The swans are so elegant, I suppose they can’t help themselves, they’re just made that way. So sorry to hear about the bus pass, bummer. What a beautiful couple they make! I wish humans could as elegant! Sorry about the bus pass. My son has lost his and in the house we think. Gives you an idea how tidy we are!!! Have a nice weekend. Ciao. A.
beautiful creatures! and I hope you get your pass back! Some DNA tests were done on our local lake black swans, and although they pair for life, they are very promiscuous. From books as a kid, I always thought swans were white, until I was older and discovered ours are black. Not sure if we have white swans. Good luck with the lost property office – you know what I mean! Andrew, I don’t know how promiscuous these two are, but I don’t think they have much opportunity as they’re the only two swans in the park!